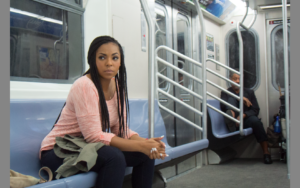 Eammon Films is proud to announce the nationwide theatrical release of Stuck, a modern musical film starring Giancarlo Esposito (“Breaking Bad”, “Better Call Saul”), Amy Madigan(Gone Baby Gone, Field of Dreams) and musical sensation Ashanti set on the New York City Subway. The supporting cast includes Omar Chaparro (Show Dogs, Compadres), Arden Cho (“Teen Wolf”) and Gerard Canonico (Broadway’s Be More Chill) as New York City commuters with stories to sing. Stuck will open in select theaters nationwide on April 19th, 2019. Markets include New York City, Los Angeles, Charlotte, Chicago, Cleveland, Columbus, Dallas, Denver, Detroit, Grand Rapids, Houston, Lansing, Philadelphia, Phoenix, Salt Lake City and Tampa. Michael Berry wrote and directed, adapting the stage musical by Riley Thomas. The music and songs in the film are all original with musical styles specific to each character – a lyrical and musical extension of their culture, thoughts, story and experience with elements of Pop, R&B, Rock, Classical and Motown. A soundtrack will soon be available.